Guest Speaker - Star Parker. 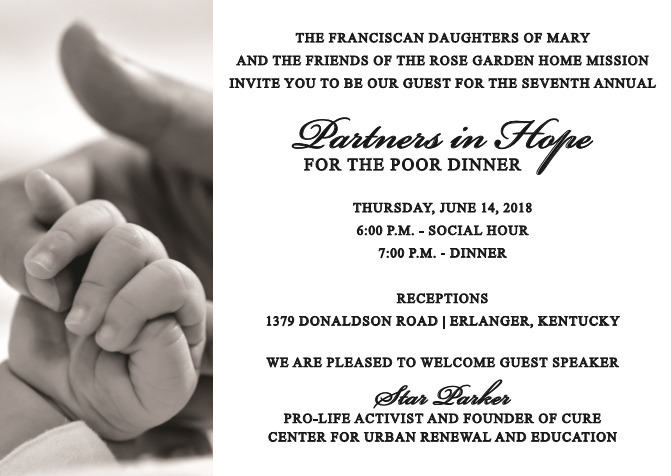 The Franciscan Daughters of Mary and the Friends of thr Rose Garden Home Mission invite you to be our guest for the seventh annual Partners in Hope for the Poor Dinner. We would be honored to have you join us for an evening of food and fellowship for a most worthy cause. Please make reservations by June 1 by emailing friendsrghm@gmail.com. Questions should also be directed to this same email address. Thank you. The Franciscan Daughters of Mary uphold the dignity of each human person who comes to them in need, by offering help and hope through Prayer, Pregnancy Care assistance, nutrition from the St. Francis Food Pantry and primary health care at the Rose Garden Center for Hope & Healing free medical clinic and free dental clinic.